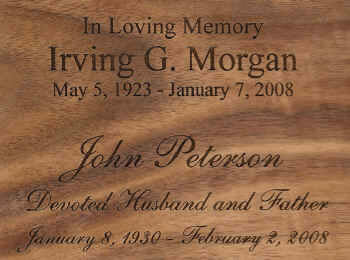 The Horizontal Photo Solid Wood Cremation Urn is the perfect way to memorialize a loved one. The photo frame is 6"W x 4"H and the photo is protected with a sheet of glass on the inside. 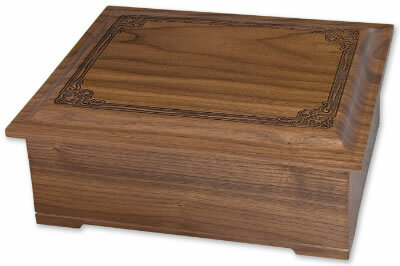 The photo is placed by removing the bottom of the urn and inserting the photo in a separate compartment from the ashes. Urn loads through the bottom by removing screws and the base. Because the photo frame takes up so much space on the front of the urn, engraving is only offered on the top of the urn or the back of the urn. Please limit engraving to no more than 35 spaces per line. Check engraving information to be sure spelling, punctuation, capitalization, and dates are correct. Engraving will be done exactly as submitted, with each line being centered. 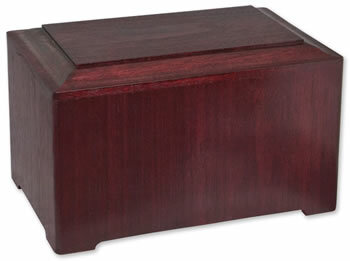 This urn is made of natural hardwoods and is available in oak, walnut, natural cherry, stained cherry (shown), or rosewood stain on hardwood. Click on the small photos to see the different woods available.